Over the years we have seen many different types of balanced scorecard: Typically these serve different organisational, governance or management needs. Understanding how different types and generation balanced scorecards serve quite different needs is important, in design implementation and use. Since Norton & Kaplan published their first article about the balanced scorecard in 1992, the Balanced Scorecard as a tool, approach and philosophy, has evolved almost beyond recognition. It has developed from an early, simplistic, measures focused control system, through to an approach that has supported strategy execution and the management of performance. Their first approach was derived from interviewing successful executives who were looking at performance in different ways and making a difference. This was further refined and developed through hundreds of consultancy engagements conducted by Norton & Kaplan’s consultancy businesses (Where i worked for over four years). It also evolved by examining how successful executives were applying the techniques to best effect. This changed the approach from balanced measurement, through ways to manage and drive performance, eventually becoming a powerful strategy management and execution approach. 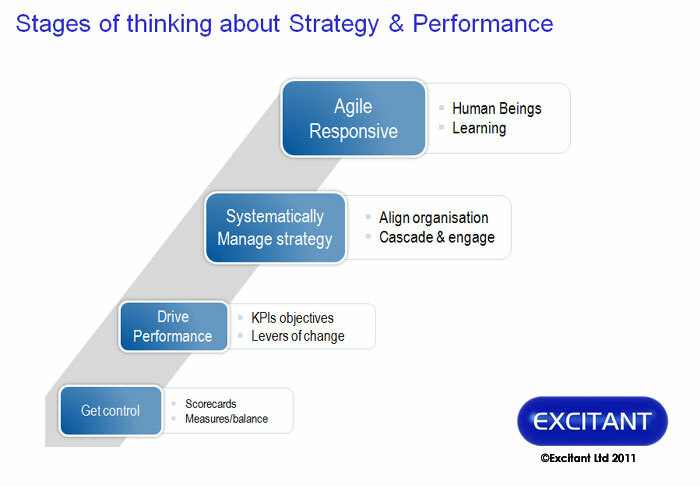 Norton & Kaplan’s Strategy Execution approach is a complete methodology, for strategy execution, alignment and management as documented in their five books, culminating in “The Execution Premium” (2008). At Excitant we have moved on from these first, second and third generation approaches. For today’s environment we need a significant shift in how we manage our strategy, people and performance. Excitant’s Fourth Generation Balanced Scorecard Approach refines and adapts their well proven approach for today’s environment. It continues to use those aspects that are is still appropriate, useful and effective, whist refining what needs to be updated for today’s environment. Yet, I still come across organisations struggling to get a grip on their organisations, influence behaviour, focus activity, get their staff to do the right things in the right way. I have been lucky enough to have worked with David Norton & Bob Kaplan, and have followed their path since 1996. Over the years it has become apparent that organisations come to the Balanced Scorecard and strategic performance management with a number of different needs. These can be thought of as a progression of thinking, but is it not always the case. It is however a useful way to classify how organisations think about their challenges and how their thinking progresses. You can think of these as generations, each serving a different purpose and therefore having different approaches and benefits . This is 1st Generation Scorecard thinking. It is about measures in perspectives. This is about systematic strategy alignment and execution. It requires a 3rd Generation strategic Balanced scorecard approach. It is important to understand that Kaplan and Norton, right from the start, saw their balanced scorecard approach as a tool of strategy and a system of management. However many organisations simplified the approach. They adopted the scorecard part to achieve a balanced set of measures. So any description of the phases of development has to start with the simplest view: A balanced scorecard as a set of measures in perspectives. For simplicity, we’ll call this first generation thinking. It often creates a simple collection of measures in perspectives. Such first generation scorecards are useful for operational measures, but are poor at describing the strategy and change. They are rarely balanced. They often contain very static measures, as opposed to ones that are designed to drive performance. They are useful, as an operational tool. Bob Kaplan refers to these as “operational scorecards” Frankly, as every set of measures gets called “a scorecard”, some are not even worth of the accolade “first generation”. Second generation balanced scorecards address the management problem “Give me measures that will drive and predict performance, because if people pay attention to these we will drive improvements.”. Second generation balanced scorecard thinking addresses the management problem “Give me measures that will drive and predict performance, because if people pay attention to these we will drive improvements.”. The focus is on the few measures, often referred to as KPIs or CSFs, that are considered important or will make the biggest difference. These are seen as leading indicators of performance. There is usually some sort of cause and effect model that shows how these leading KPIs or measures drive improvement. They sometimes have objectives to which these measures are assigned (but not always). If they include a model of performance it is usually a performance driver model. They start to reflect change in operations and they describe what drives performance. Second generation balanced scorecards are more selective than first generation in their choice of measures. The few measures are chosen to focus the organisation’s attention on the most important drivers of change or performance. To get a sense of whether you are at least beyond generation one, this article explains where the second generation thinking and principles kick in. What makes a balanced scorecard balanced. It might not be what you think. This article explains how there are many different types of leading indicator. However, whilst this approach is often used as a part of a strategy and change programme, it is only focusing on a few measures (KPIs or CSFs). It is not systematically aligning the organisation, its resources and attention, around the strategy. Third Generation balanced scorecards address the management question “How do we implement strategy, systematically, so we are sure it will deliver?”. They are not merely a set of measures on a scorecard. It is a system of management. Third generation thinking is about systematic, methodical implementation of strategy. These Strategic Balanced Scorecards address what Norton & Kaplan set out to address: Strategy, its management and implementation. There are various views on third generation balanced scorecards. Norton & Kaplan’s developments of their earlier versions which, though not generally recognised, emphasise the, articulation of strategy through the strategy map, the alignment of the organisation. the role of the Office of Strategy Management and ultimately about strategy execution. Cobbland and Lawrie’s Third Generation Balanced Scorecards that emphasise the Destination Statement, the problem of information asymmetry in setting objectives and targets and various implementation problems. These two approaches have more in common than they have differences. Both contain strategy maps, cascaded through the organisation. Both set levels of ambition over time, though Cobbland and Lawrie use the Destination Statement, whereas Norton & Kaplan’ published approach does not (Even though we were using future statements in the UK office back in 1997/8). Both generally use four perspectives (though Cobbland and Lawrie suggest dropping two for public sector organisations) . Both use strategic themes that cross the four perspectives and show the tension in the strategy. Both use objectives, before measures. Both have scorecards that reflect the measures and targets, but also the the change projects that will bring about the increase in performance. The projects can be organised into programmes of change that align with the strategic themes. They create conversation, generate understanding and help management learn from their strategy as they implement it. Both put emphasis on the management team agreeing the strategy and communicating it consistently. Both emphasise organisational alignment and communication. Overall, the third generation balanced scorecard approach is designed to capture a strategy, systematically align resources and the organisation, and track the implementation of that strategy over time. This is useful for many organisations. At Excitant we have implemented many 3rd Generation systematic strategy implementation balanced scorecards approaches. Today, we find that clients come from a different place. Recognising they manage amidst uncertainty and risk, they want agility and responsiveness and the ability to learn as they execute their strategy. They realise that control and measures are inadequate, it is about treating people as human beings, focusing on behaviours, not simply measures and targets. They need to empower people to make decisions locally, have conversations with customers in a human voice and that the most successful executives are managing with both left and right brains. They need ways to capture and manage their new models of business and new ways of thinking about strategy more appropriate to the second and third decade of the 21st century. This is why the Excitant Fourth Generation Strategic Balanced scorecard have evolved. To answer this different management need.